And we’ve got a series, folks. [firstpara] Staring down a 3-1 hole--a deficit no team has ever come back from in the NBA Finals--the Mavs gutted it out, and successfully tied the series two games apiece. Dallas claws its way back, with no sure victor until the final buzzer sounds. Unlike the previous game though, the spin of the ball favored Dallas this time around, with the final margin 89-86. The series is now down to a best-of-three, and we’ll see on Game 5, who’ll be able to eke out that pivotal victory in what has been a classic series so far. For three quarters, Nowitzki struggled uncharacteristically, missing and wasting a lot of good looks, and had a hard time finishing near the basket. To the Heat’s credit, the defense was extremely active, as it has been all series long. But as was revealed later in on the game, Dirk was suffering from a case of the flu, and was not nearly feeling a hundred percent. Still, even in his slightly limited state, the Mavericks got him the ball in the fourth quarter, continued to run the offense through him, and were justly rewarded. His line: 21 points, 11 rebounds. Nothing astounding (and he shot a horrible 6 out of 19 from the field) but what impresses is that 10 of those points and 5 of those rebounds came in the final quarter, including that layup which gave them the lead for good. The layup showed a little cleverness on the part of Dirk, as he drove hard right, knowing Haslem, his defender, was once again anticipating him to spin left. Brilliant. Wade brought the aggression once again, and bullied his way to a game-leading 32 points. And that was just a part of the tremendous game Wade played. He gave his team a couple more possessions with 4 offensive boards; he was once again active in the passing lanes, coming up with two steals; and his help defense was at its sharpest, with the highlight being a monster block against Tyson Chandler, who stood 7 feet tall. He almost nearly block Dirk’s final layup too, and would have gotten to it we think, if Dirk didn’t have the benefit of length. His will and stellar performance came with a couple of noteworthy hiccups though that might have cost his team the game. First, he missed a free throw that would have kept the game tied. Second, he fumbled an inbounds pass, and effectively botched a play for a probable tying three-pointer. 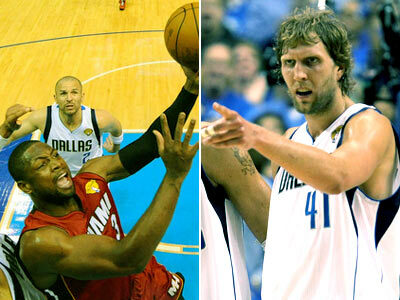 Still, the tone has been set: Wade’s going to be the one to put the most pressure on the Mavs defense. Props to Bosh as well who looked confident and steady as he poured in 24 points on 9 out of 19 shooting. James did however showcase his sharp playmaking skills, although it wasn’t in the fourth quarter. In the second quarter, the Heat ran the same set play for two consecutive possessions, which involved Wade coming from the opposite baseline, off a screen from their big man, Joel Anthony. In the first try, the big man defending the screener saw Wade coming and decided to hedge the streaking Wade. Anthony got freed up, and James found him for an easy dunk. In the second attempt, the defending big man stayed on Anthony, Wade received the ball from the James, and with the help defense far from him, was able to smoothly curl to the basket for an easy deuce. But those moments were too far and few between, and his impact on the game just wasn’t enough. His defense, which has been rightfully trumpeted by acute observers, wasn’t as sharp tonight. In one critical possession in the fourth in the middle of the Mavs comeback, James let Marion score. Jason Terry was also able to score six straight points with Lebron on him, which ignited the rally. To cap things off, James also finished with 4 turnovers. How will he respond? We know he’ll be attacking the rim again in the next game, but the question is: will he still be there in the fourth as Dirk, and Wade have? With Dirk battling the flu, his teammates thankfully stepped up. Tyson Chandler provided the intensity, finishing with 13 points and 16 rebounds, 9 of which coming from the offensive end. Marion was big with his 17 points, as was Barea with his 8 points, although he did miss a lot of lay-ups. Off the bench, Terry was streaky at times, but found his touch at the right time, finishing with 17 big points. Even Deshawn Stevenson had a big night by his standards, scoring 11 points, while providing solid defense. Stojakovic, meanwhile still sucked, playing just 2 seconds in the game. On the other end, only Bosh and Wade scored in double figures. Mike Miller had 6, Haslem had 4, Chalmers had 5, and Joel Anthony had 4. And have we mentioned Lebron? It’s a dogfight alright. No one is backing down, and it’s not just all bark. Both teams are pulling out all their tricks, and the gravity of every shot is starting to grow heavier as the series goes on. In the fourth alone, there were long stretches were both teams were getting open looks, but kept on missing. The passing lanes were clogged; every rebound was fought for, which only tells us one thing: this series has really become a test of will.